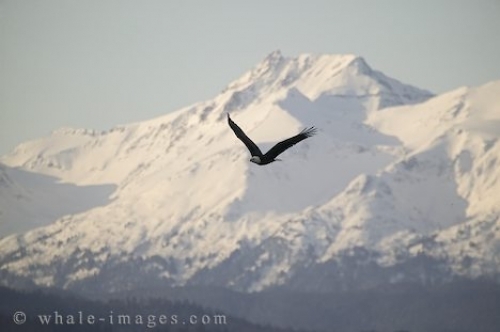 A Bald Eagle soaring near the beautiful snow covered Alaskan mountains in Homer, Alaska, USA. There is nothing more beautiful than seeing a bald eagle soar high above the earth's surface amongst snow covered Alaskan mountain peaks in Homer, Alaska. This bald eagle shows what freedom is all about and you can understand why it is the living symbol of the USA's freedoms, spirit and pursuit of excellence in Homer, Alaska. The silhouette of this magnificent bird is extremely prominent with the stunning snow mass of the Alaskan mountains in the backdrop. The bald eagle can grow to be between 29 to 42 inches in length and can weigh somewhere between 7 to 15 pounds. Their wing span is approximately 6 to 8 feet which is a little more than the height of most people. Homer, Alaska in the USA has special bald eagle watching locations to watch these incredible birds in their natural environment. These majestic creatures congregate here for the winter mainly because of a woman named Jean Keen who feeds the bald eagles on a regular daily basis in the winter. Some believe she is causing harm for the bald eagle and the surroundings of the natural ways of life and others believe that the bald eagle would not survive the Alaskan winters without her. Only you can decide for yourself after visiting Homer, Alaska and learning all the facts of the situation and seeing this spectacular event for yourself.